Looking for a quick and easy art project? Or need an inexpensive art piece? I was looking for thirty and unique artwork when I remembered something I saw from Better Homes and Garden that gave me a few ideas. I’ve been collecting picture frames when they are on sale for a hall photo gallery I’m planning so I had a few frames on hand. 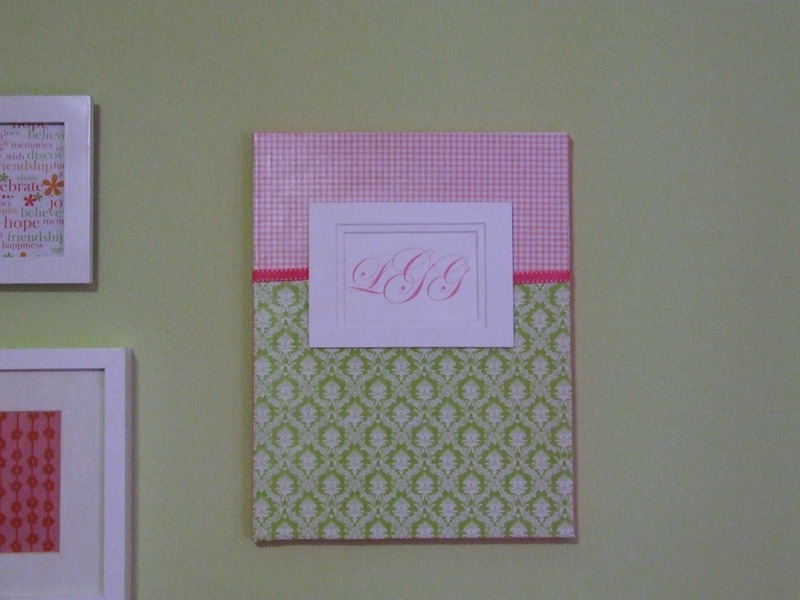 Why not frame scrapbook paper! It comes in so many cool colors, patterns and designs! 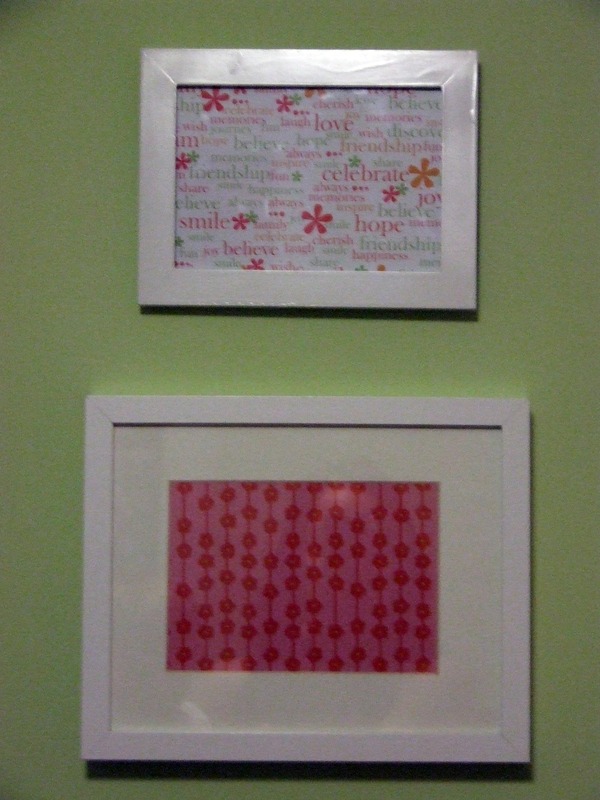 Here are a few pages of scrapbook paper framed in Lily’s room. My neighbor, Alison, stopped by while I had everything sprawled out on my dining room table and liked the idea so much she decided to create a scrapbook display for her sunroom. I have artwork envy! I love how hers turned out!!! Another idea is to frame fabric. I purchased a duvet in the ‘as is’ section of Ikea for $10. 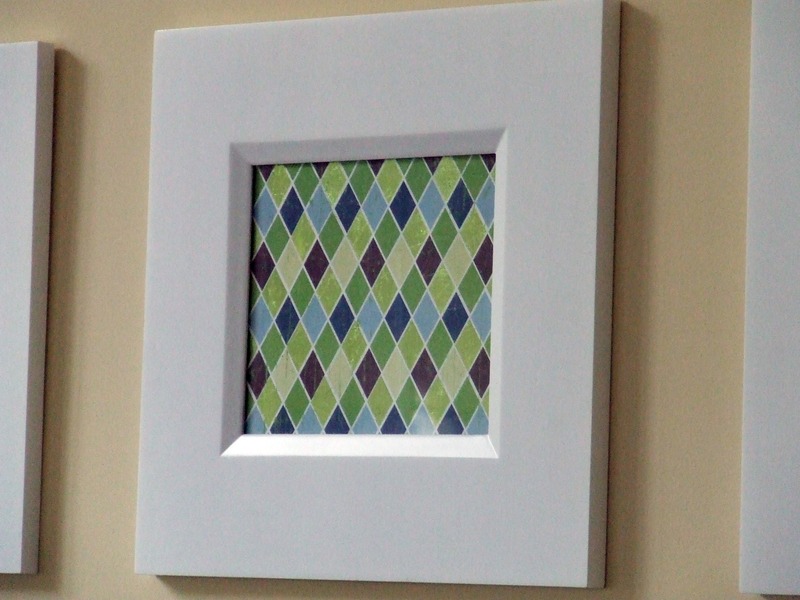 While I determine how to use the bulk of the material, I went ahead and framed some pieces for the playroom. This was my first decoupage project and I’ll admit it was not as easy as framing paper or fabric. I had some challenges keeping the paper from bubbling. If you have tips to share – please do!!! I applied Mod Podge to a stretched canvas, layered a couple of piece of scrapbook paper and then coated it with another layer of Mod Podge. The monogram is Lily’s initials in a Word document. I used Edwardian Script font. I hot glued the matte frame and the monogram and painted the canvases edges to finish this piece. I had a couple of frames that were missing the glass but I couldn’t bring myself to throw them away. I spray painted a frame to match Lily’s decor and I hung it on the wall. 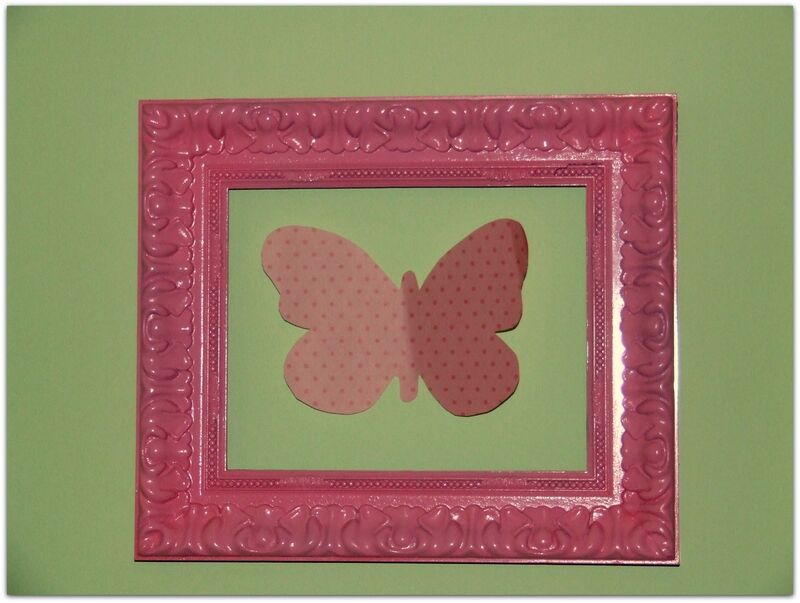 Centered in the frame is a butterfly cut from scrapbook paper. I see a theme here – I have a lot of extra scrapbook paper lying around our house! I’m surprised at how much I liked this. In fact, I’m going to incorporate this idea into my hall gallery. Have any secrets on how to transform scraps to art? Do tell!! This entry was posted in Decorating, DIY Projects, Our Home and tagged artwork, decorating, DIY projects. Bookmark the permalink.